There are a ton of packs out there one the market but the Rush Moab 10 pack delivers something a bit different and unique to those looking for a extremely useful sized 1-3 day pack. 5.11 Tactical’s mission is “We are innovators who make purpose built gear for the most demanding missions.” That does not mean uber tactical defense. In reality 5.11 was named after the Yosemite Decimal Difficulty system for rock climbing. The focus of the company is to deliver innovation and based what I saw on this pack, they are executing in a big way. The 5.11 Rush Moab 10 is based on a newer single strap pack design which has become popular for micro to mid-sized packs. Most of us are familiar with typical two strap over-the-shoulder backpacks. Ultimately dual over-shoulder straps provide the best the load bearing support when weights add up over distance if properly adjusted/fit, however on short trips and with lighter loads, we humans tend to grab just one strap, sling it over our shoulder, and head out... thus the single strap packs were developed. Obviously by design the single strap packs carry the same amount of weight far more comfortably than a two-strap pack when used incorrectly with just one strap. Simply put, if you are a single strap pack carry kinda person who does not carry weighted packs, then this newer single strap design may be for you. 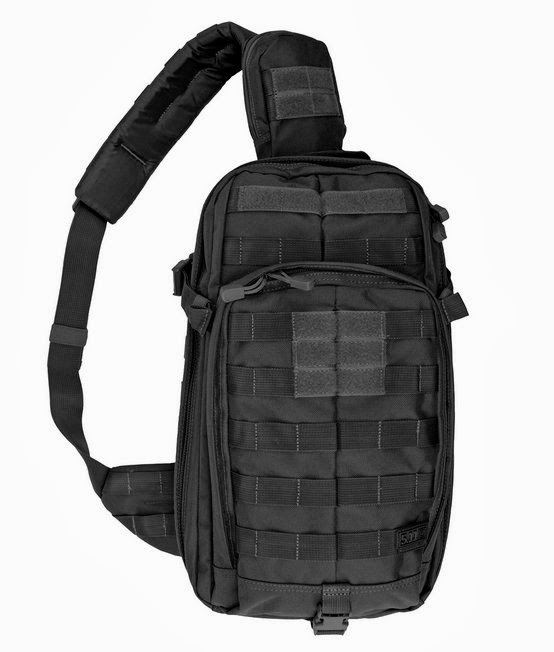 The Moab 10 is designed to be carried in one of two ways; a simple over the shoulder carry or cross body carry. For quick trips around town, while traveling, brisk short walks from terminal to terminal, the leisurely walk out to the hunting stand or range, or just handling the daily commute, tossing over the shoulder and using the carry side thumb to secure the Moab Rush 10 works fine. The pack features a quick adjust strap which can be tightened to cinch the pack up close to the body. The pack is pretty secure at this point, however a thumb is still required to keep the pack in place. Picking up the pace or when having the need for both hands is when the cross-chest-carry really makes this single-strap pack design shine. In this position the Moab 10 is secure as a regular pack, does not move I around on the body and has one very cool trick it can perform; access to the pack storage without removing the pack. Simply slide the pack from your back to your chest and at that point the pack will be perfectly horizontal at your chest with one side's YKK zippers accessible. With Moab's double YKK zippers on all seams accessing your stuff in any of the five compartments becomes really easy. An extra compartment is a hidden velcro concealed carry pocket which delivers a pretty speedy carry and draw location for even a large full sized firearm like the PPX pictured with Surefire tactical light attached. Actually the Moab 10 is big enough to carry a Keltec Sub2000 folding rifle and can be quickly deployed via this cross body carry and draw method. Like every 5.11 product I have ever used the Rush Moab is very high quality heavy weight ballistic nylon made with premium double YKK zippers with pull tabs on all main compartments. Generally I prefer packs that do not have a lot of pre-prescribed internal organization simply because they usually do not fit my needs well and end up wasting space and just adding material weight to the pack in the form of more pockets, more webbing, and more material. That noted 5.11 has struck a pretty perfect compromise of useable pockets without going overboard. The Moab Rush 10 has six externally accessible pockets/compartments with most having additional pockets within. The two hidden pockets include a small shallow zipper accessible fleece lined sunglasses pocket and the hidden Velcro lined concealed carry pocket. The sunglasses pocket is unbelievably useful unless you like big nasty scratches in your $100+ sunglasses. The hidden conceal carry pocket nested between the front pocket and main compartment is so well concealed that I didn't even know it was there until I watched one of 5.11's videos. This compartment is huge and can handle handguns of pretty much every size; 1911s, Glock G29 10mm, or pistols such as the new Walther PPX shown. In fact you could probably get a couple handguns in there if needed. The small attached coms/communication pouch on the strap is designed to house your media players or 2-way radio and includes a pass through for headset wires as well as internal straps to retain items in this small index card sized compartment. The rearmost hydration compartment is sized to handle pretty much any large sized hydration bladder (not included) and includes T-toggles to secure the bladder. The compartment also has an internal pocket which holds a stiff plastic backer plate to improve comfort or it can be removed. The hydration pocket compartment and main compartment are both set up to pass the hydration hose up and thru to enable threading the tube down the strap for easy on the go access. In fact the main compartment can also be used as a secondary hydration bladder locations however it does not have T-toggles to keep the bladder standing securely upright. The main compartment features a large shove it pouch with a bungee, a dual sided access set of mesh pockets and a large dual zipper accessible center pouch. It is quite amazing what you can carry in this pocket considering the size of the pack. It can handle a full sized laptop + iPad + periodical + a whole lot of other miscellaneous items and still have room left over. Of note this pack has become my real job travel bag simply because it can carry all the above crap infinitely more comfortably than my other briefcases and laptop bags all while still feeling like you are carrying far less weight. 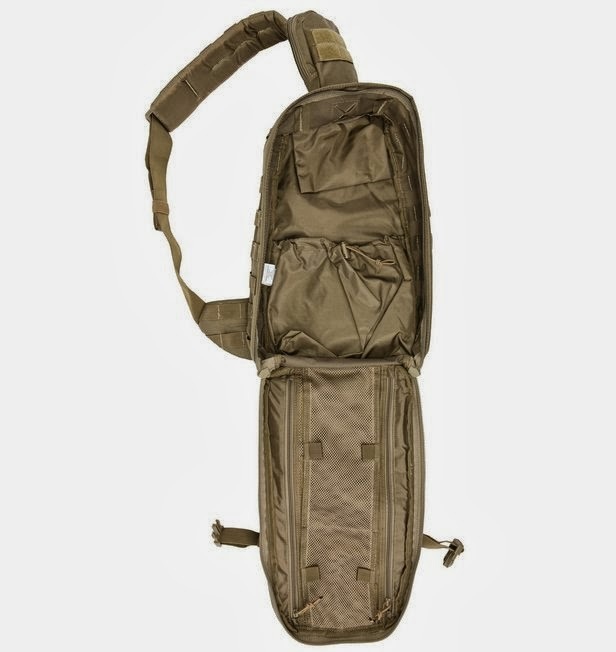 The front admin compartment features two shove it pouches large enough for two 30-round AR mags and the backside of the compartment has a variety of pouches for business card/ID slots, pen, pencils, sports. Other features are dual keychain leads and a large zippered pouch. One of the features I love on this pack is the inclusion of a two top and a bottom cinch straps to deliver a tighter more controllable pack when loads are smaller. Covering the Moab Rush 10 is a Molle compatible Web system and a number do Velcro fields in strategic areas for moral or ID patches. The attachment points definitely do not limit you from an attachment or lashing perspective. Some may think Moab is a great place for a hike, however in this case Moab stands for Mobile Operation Attachment Bag. This is a bag Tiering system which allows the user to attach this smaller bag, piggyback style, to another bag or pack. For example, you could attach this pack to a larger hiking/deployment/bug out bag while providing the ability to quickly drop the larger pack and roll out with the smaller bag. 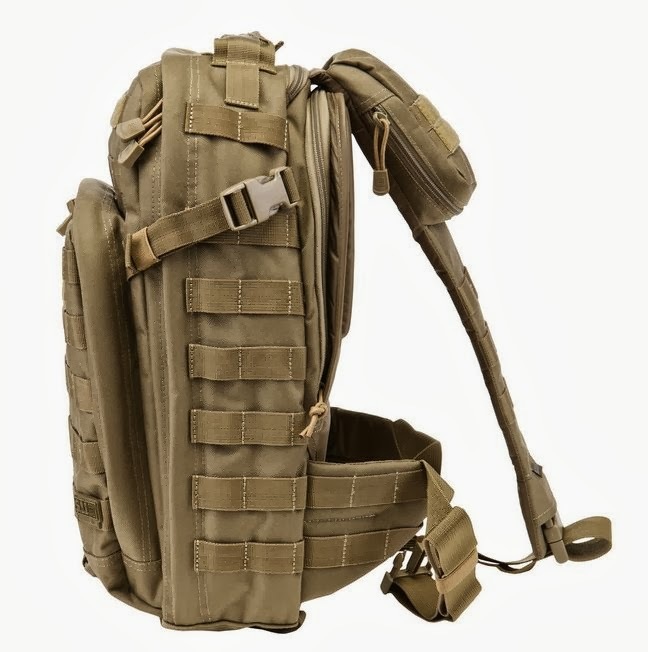 This is facilitated by the included web/molle compatible straps and split buckle ends that can be attached between the connecting bags and then left in place. To date, I have over three weeks straight of dragging this bag all over the country and the more I carry the 5.11 MOAB Rush 10, the more I like it. It is fast handling, compact, and easy to handle even with heavier loads as a laptop carrier. From a size perspective, this is a great small 3-day pack which provides a lot of user flexibility and a great concealed carry option. An all around excellent pack which I can strongly recommend. I liked this bag at first. Once I loaded it up and carried it for extended periods, I decided the single uncomfortable strap was not for me. I can't really pinpoint what it is about the shoulder strap that I don't like. It's just not comfortable. It almost feels too thick and bulky. I carried lunches and water in it around the zoo for a day and was miserable.